Daylight hours are shorter and dropping temps are cooling off the lakes and rivers. Lake turnover has passed, and fish are feeding heavily during this time of ample forage. Now is the perfect time to employ more aggressive lures to target larger walleyes. During the past few years I have been predominately using Jigging Raps in the fall to locate the larger, more aggressive fish in a school. In order to target fish with this method, put your electronics to work and find fish before wetting a line. Baitfish scatter after turnover , and walleyes and other predators are cruising around chasing after schools of bait. We can find fish over a wide variety of depths this time of year. They can drop down into some of the deepest holes in the lake during the day, then push up onto points and flats during lowlight periods (You can check out my previous blog: Catching fish around the challenging “fall turnover”). 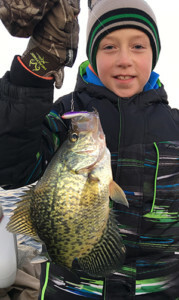 Don’t forget about fall crappies: Author’s son, Parker Revermann caught this slab while fishing with his dad over the weekend. You just have to slow up your jigging stroke a bit for the crappies! Examine a lake map and identify the steepest breaks you can find. I’m looking for breaks near a lake’s deepest depths. If there is a 15- or 20-foot flat, and it drops down to 30 or 40 feet (or maybe even 60 feet or more), search for baitfish and predators. Schools of fish in the areas will be constantly adjusting depths, and you have to make sure to follow them. They can be in 60 feet over most of the day, but when that sun begins to fade they are pushing up into the shallower water. Walleyes will be chasing baitfish against the steep breaks and following them onto the flats and into the weeds over the evening hours, then back into the deeper holes during the day. Don’t get stuck fishing the same depth if you’re not catching anything; move around to follow active fish. 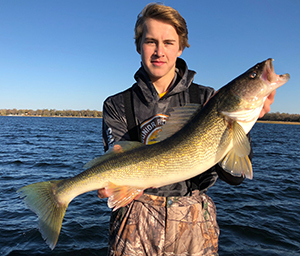 Junior Pro Team member, Jack Pojar, of Maple Grove, caught and released this 28 1/2-inch walleye while fishing with the author over the weekend. Once I locate larger fish in these areas I will drive around until I see a large mark, put the motor in reverse, stop on the spot, and drop a No.7 Jigging Rap to the bottom. When it hits bottom I close the bail and rip the lure up a couple feet and let it fall back to the bottom on a slack line and repeat. If you drop down below your boat you usually can watch the lure rise and fall on your locator and also see when a fish approaches. If you notice fish coming in and not hitting, experiment with faster or slower jigging strokes or longer pauses on the bottom or at the top when you rip up the lure. Usually, the hit will occur as you rip up on the lure thus also setting the hook. Not all hookups will be clean; sometimes you will catch them outside the mouth as they are about to strike such an aggressive darting bait. A longer rod with a soft tip works best for absorbing large head-shakes and runs to keep fish hooked up. Aggressive jigging baits are special because they seem to produce more big fish, but some other methods to target these schools of fish include live bait rigging with minnows or a simple jig-and-minnow approach. Walleyes will continue to feed in these areas even after lakes begin to freeze so remember these hard-water locations when ice conditions permit. Good luck fishing and stay safe.